I haven't made bread in a while. It was hot, and I was preoccupied with other things and wasn't very hungry. Now, however, fall is here and my appetite has returned. 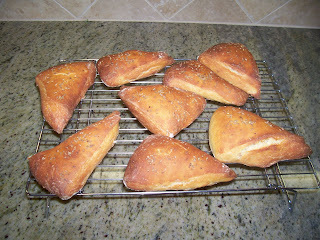 On the 'Artisan Bread in Five Minutes a Day" blog, they posted a recipe for Sweet Provencal Flatbread with Anise Seeds. That got my attention. I love anise and always have anise seeds on hand. I also like combinations of sweet and savory flavors, and thought this would be good in sandwiches as well as for breakfast. I've blogged about this method of making bread before. You make a big batch of wet dough, let it rise for a few hours, and then store it in the fridge until you're ready to use it. At that point, pull out as much dough as you need, shape it, let it rise, and bake it. The anise orange bread recipe was pretty typical. I mixed up a batch and let it rise at room temperature. I forgot to add the olive oil, since I'm so used to making oil-free breads so it completely slipped my mind. The end result will be chewier and crustier, which is fine with me. After two hours, the dough was threatening to overflow the bowl if it continued to rise, so I put it in the fridge. This morning, I took the dough out of the fridge and pulled out about 1/3 of it. I dusted it with flour and rolled it out like a thick pizza. I then cut it into eight wedges, brushed each wedge with water, and sprinkled anise seeds on top. I wasn't in a hurry, so I let them rise for an hour or so rather than bake them immediately, like they did in the blog. The wedges puffed up somewhat. I'd set the wedges on a silicone baking mat, so I just put this directly in the oven on top of the pizza stone. After they'd been in the oven for a few minutes, they had risen to about twice their initial thickness. I baked them were for 20 minutes. I ate one for lunch. It was quite tasty. It had a nice aromatic favor from the anise and orange, but wasn't sweet. I just ate it with butter, but it would taste good with either jam or with meat or cheese. I still have a lot of the dough in the fridge, and when i bake the rest I may just bake it as a boule, or even use it as pizza dough for a pizza without tomato sauce.